Longer nights, cooler mornings, rainy days… It’s a great time for warm drinks. Save this recipe to serve as part of your winter and Christmas celebrations. It has the colour and flavours that are sure to tickle your guest’s taste buds. And the colour and aromas all shout “let’s ignore the weather outside”! This recipe can also be made with fresh, local cider. Place the broken cinnamon sticks, cloves and allspice in a tea ball, or tie them up in a cheesecloth pouch (see Note). Combine the juices and honey in a pot. Add the spice ball. Bring to just below a simmer. Mull the juices 30 minutes, or until nicely flavoured. Pour into mugs or heatproof glasses. If desired, garnish each drink with a cinnamon stick, an apple slice or 2, and a few pomegranate seeds. Note: If you don’t have a tea ball or cheesecloth, simply add the spices directly to the pot. Strain out the spices, once the juices have been mulled. 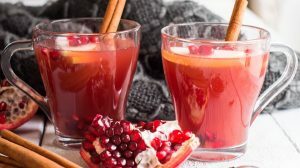 Recipe Options: Make mulled apple and cranberry juice by replacing the pomegranate juice with 1 3/4 cups cranberry juice. Use apple cider in this recipe instead of apple juice. For an alcoholic punch, mix 3/4 cup of brandy into the juices before mulling them. 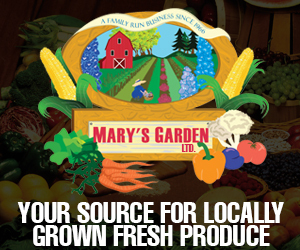 Thanks to Thrifty Foods for sharing this recipe!